I am an only child and was born in Nashville in 1943. We moved to Memphis when I was about six years old because my father got a promotion to be the agency director for Universal Life Insurance Company here. We lived in an all-black neighborhood. At the time, the South was racially segregated. We were upper middle class by overall American standards and were probably considered "well to do" by black standards at that time. We lived in a very nice neighborhood on South Parkway East. My mother had a master's degree in English and taught at Porter Junior High School, which today is the Martin Luther King Jr. Educational and Cultural Center. By her being an English teacher, she not only taught me proper English rules, but she provided me with knowledge in many educational areas. My dad did not go to college, but he was successful professionally. He was a people person, which helped him progress throughout his career. Both parents stressed the importance of education. My maternal grandmother lived with us. Grandmothers have the luxury of loving you without having to discipline you! Because both of my parents worked during the day, I spent the days with my grandmother, who was a very big influence on my life. When I got to be about six years old, I became aware of the country's segregated society. The effects of segregation and the Civil Rights Movement greatly influenced my life. Although my parents told me I was a good person and should be proud of who I am, everything going on around me told me differently. Why can I only go to the zoo on certain days? Why do I have to use a separate restroom and a separate water fountain? Why do I have to sit at the very top of the movie houses? Why can't I go through an establishment's front door? Those things are difficult for anyone, and no matter what your parents tell you, it's hard to totally ignore all the other influences and cues you're receiving. So it was easy to grow up with a sense of inferiority. For the 10th grade, my father — after extensive research on his part — sent me to Westminster Preparatory School in Connecticut. My dad wanted me to leave the South to go to school. He thought I'd get a better education and have better opportunities. I entered Yale University in 1959 when I was 16 years old. My father told me that according to his research, Yale was the best college in the country. Of 1,000 classmates at Yale, probably four were black. Back then, blacks typically attended all-black colleges in the South, so it was unusual for blacks to go to the Ivy League. I still didn't really know what I wanted to do, but a career in media never entered my thoughts. I always liked to write, however, and it was writing that would ultimately lead me into media. After majoring in economics at Yale, I joined the Air Force Reserve because at the time, there was a military draft. Afterward, I got my master's in business administration from the University of Michigan, and then came back to Memphis to work at Universal Life Insurance, where my father worked. Shortly after Dr. Martin Luther King Jr. was killed in 1968, I contacted The Commercial Appeal and expressed interest in writing a column that reflected a black viewpoint about everything that was going on. The paper didn't have any columnists writing from the black perspective, which, of course, was very different from the white perspective. They agreed, and I started writing a weekly editorial. That fall, WMC-TV approached me about being a news anchor. At the time, there was more effort to integrate media. I'd never thought about being on television. I told them I already had a job, so I'd only be available on weekends. They hired me as their weekend anchor. 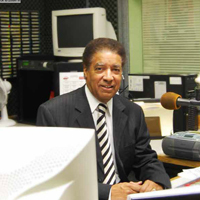 In 1974, Harold Ford Sr. was elected to Congress. He asked me to go to Washington D.C. and be his administrative assistant. At that point, I was pretty sure that the insurance business was not the career I would pursue, so I agreed. Washington is where I really became interested in radio. By that time, media was something I had been doing and liked doing. I knew I was interested in it — but radio more than television. I decided I'd attempt to buy a radio station and get involved in that medium. I visited Benjamin Hooks, who was a Federal Communications Commissioner at the time. He gave me the names of a couple of media brokers, whom I went to visit. It turns out there was a radio station for sale in Memphis: WLOK. I thought, Wow, I grew up listening to WLOK! I came back to Memphis in 1976 and spent more than a year putting together the financing to purchase the station. At that time, you could make a purchase agreement and then take time to find the funds. I launched Gilliam Communications Inc. and bought WLOK in 1977. In doing so, WLOK became the first black-owned Memphis radio station and also the city's first locally owned station. But those milestones really weren't on my radar at the time. Instead, I was just focused on fulfilling a dream — a dream that celebrates 35 years this year. When I bought WLOK in 1977 … it was not a gospel station; it was an R&B station. At that time, black stations tended to play a fairly wide range of different types of music. We changed the format in the '80s when FM came in vogue and AM was becoming less the dial of choice. When we decided to look into different format possibilities, we chose to play gospel in the evenings, and we did very well ratings-wise. So we gradually expanded that gospel offering to what it is today. I chose to buy a radio station instead of work at one because … having worked at Universal Life, I understood that black business ownership was possible. I had an interest in the ownership aspect because I knew I'd have more opportunity to influence what was going on in my community. I thought, if I'm in charge and making good decisions, there are more things I can do. When I told my mother I was quitting work to buy a radio station, she … was in tears! She thought it was crazy that I would quit a stable job at the insurance company to do something like buy a radio station! At the station's 20th anniversary celebration, I was glad she was there to see what had become of it all. She was crying at that time, too, but for a different reason! When I bought the station, I was … too young to be nervous about it! I'd be more nervous now if I did that, but when you're young, you just don't think about things in the same way. I hadn't gained enough experience at that time to see all the things I should be nervous about! When I first walked into WLOK as its owner … it was terrific! It was the fulfillment of a dream and a goal to own a radio station. One of the early lessons I learned … is there will be ups and downs, and you just have to go with it. Growing up, my favorite radio station was … ironically, WLOK! It had become more of the younger adult station, as opposed to WDIA, which was geared more toward adults. When WLOK first went on the air in 1956, I was … 13 years old and on my way from Memphis to prep school in Connecticut. My initial challenges as a black radio station owner … Back then, the city was still segregated in many ways, and the challenges were many. Our biggest challenge involved convincing the white business community to use a black medium to reach a special market niche. We transformed WLOK into a powerhouse by … relating to the audience. As simple as that. More important, we weren't "just about records." We did a lot of community service work — which was fairly unusual for radio stations back then — and the community responded to that. Some of the biggest changes we made to the radio station include … When I first came in, we had a white sales force and a black programming staff. So we made changes whereby everyone had the same opportunities. Also, there weren't many women in radio at that time. We made it a policy that we would hire whoever was the best, most qualified person for the job, regardless of gender or race. When the Tennessee Historical Commission designated WLOK a state historical landmark in 1997, I … felt we earned it and deserved it, and I was honored by it. Being a television news anchor … changed my life. It was a young environment, and it was an exciting one. I anchored the news on Saturdays, then pulled together my special reports during the day — typically at lunchtime because I was working full time at Universal Life. I remember experiencing racial inequality … Things like having to sit in the back of the bus. I even remember the sign in the bus: "Colored passengers occupy rear seats first." The first time I rode the bus, my mother took me. I was just a kid and sat down in the first seat. She said, "We've got to move back." I asked, "Why?" She had to explain it to me. When I got older, there were times I was put off of the bus because I refused to sit in the back. I was always younger than my classmates because … at that time, students were tested to determine what grade you belonged in academically. I was six years old and tested at a fourth-grade level, so by the time I entered college at Yale, I was only 16. One of the most difficult decisions I made … was buying WLOK! When Elvis hit the music world, I … was a young teenager. He really wasn't on my radar much because music was more separated. So Elvis — although I knew some of his songs — wasn't being played much on the radio stations I listened to. WLOK Stone Soul Picnic … is an annual promotion that launched two years before I bought the station. It's a free event for the public. It started from spinning records and giving out a few hotdogs in Martin Luther King Park and grew to a large festival with many thousands of people, a main stage, and food vendors in Tom Lee Park. When I'm not listening to WLOK, I … enjoy "oldies" music. From my mother I got … perseverance. She was a very positive, bright person. She played bridge and was very good at it, partly because she had good mathematical abilities. She was very trustworthy, so she acted as treasurer for many organizations. From my father I got … my sense of humor. Also, dedication to work. And from both my parents, I got my honesty, trustworthiness, and integrity. During my time in the Air Force Reserve, I learned … that unlike the general society, the military was not as racially segregated. On the other hand, the military would send you to Vietnam to get shot at, but you'd return to a segregated society. Even in my military uniform, they tried in the South to force me to order my food at a separate window from whites. Some of my fondest childhood memories … We made a lot of road trips by car to various places. By the time I got out of high school, I'd been to most of the states in the country. We always had dinner together, and I learned a lot just by listening to the conversations between my parents. When I'm not being Mr. WLOK, I like to … go to movies. I also enjoy the various community service projects I'm involved with. When Dr. Martin Luther King Jr. was assassinated, I was … 25 years old and working at Universal Life Insurance. But backing up five years, I was more shocked when President John F. Kennedy was killed than I was when Dr. King was killed. I remember Kennedy's assassination more distinctly than Dr. King's. I think that when you're young, the first time something like this happens, it's a shock you never forget. The notion that a very popular president of the United States — and a president who was very favorable to blacks — would get shot was incredible to me. The first time I marched … was right after Dr. King was shot. People were lined up from Downtown to where I was at Linden and Danny Thomas. There must have been 50,000 people. It was a march in commemoration of Dr. King and was an extremely solemn march. After Dr. King was assassinated, I was frightened of … being in Mississippi. It felt dangerous because of all that was happening there. I didn't think of Memphis as being as dangerous as Mississippi. Most people don't know that I … am shy at times. If I could spend one hour with anyone … Nelson Mandela. I'd like to meet this man who was able to do so much in terms of apartheid and still keep his positive spirit alive in the face of such adversity and under such unimaginable conditions. It's amazing to me. People might be surprised to learn that I … met my wife on the internet! Dorrit was a tutor in Copenhagen when we connected eight years ago, and we married March 12, 2005. Items remaining on my bucket list include … I like to spend time at ocean beaches. I've traveled to the beach a lot, but I still love it. My final 2 cents … Always treat people the way you want to be treated.